Prompted by recent observations of seasonal low dissolved oxygen from two moorings in the North Sea, a hydrographic survey in August 2010 mapped the spatial extent of summer oxygen depletion. Typical near-bed dissolved oxygen saturations in the stratified regions of the North Sea were 75–80 % while the well-mixed regions of the southern North Sea reached 90 %. Two regions of strong thermal stratification, the area between the Dooley and Central North Sea Currents and the area known as the Oyster Grounds, had oxygen saturations as low as 65 and 70 % (200 and 180 μmol dm−3) respectively. Low dissolved oxygen was apparent in regions characterised by low advection, high stratification, elevated organic matter production from the spring bloom and a deep chlorophyll maximum. Historical data over the last century from the International Council for the Exploration of the Sea oceanographic database highlight an increase in seasonal oxygen depletion and a warming over the past 20 years. The 2010 survey is consistent with, and reinforces, the signal of recent depleted oxygen at key locations seen in the (albeit sparse) historical data. An erratum to this article is available at http://dx.doi.org/10.1007/s10533-016-0258-9. Dissolved oxygen is necessary for the proper functioning of most marine ecosystems. In aquatic environments, the oxygen either diffuses from the atmosphere or is produced by photosynthesising organisms in the euphotic layer and is then transported by currents to different regions or mixed to depths where it is utilised. Low dissolved oxygen, or hypoxia, arises in situations where the rate of oxygen supply is less than the rate of consumption for a significant period. Hypoxia is defined as oxygen concentrations below 4–6 mg dm−3 (125–190 μmol dm−3) by the Oslo and Paris Commission (OSPAR) in the Ecological Quality Objective (EcoQO) for the North Sea (Painting et al. 2005). This threshold was selected as it is generally considered that organisms may suffer sub-lethal, and potentially lethal, effects below this oxygen concentration (Diaz and Rosenberg 2008; Vaquer-Sunyer and Duarte 2008). Nevertheless, higher concentrations than considered hypoxic by OSPAR may cause harmful impacts on marine organisms (Pörtner and Knust 2007). Hypoxia in stratified shelf seas is a complex phenomenon dependent on multiple interrelated factors. The most common mechanism is the export of large amounts of organic matter to the bottom of the water column, often originating from seasonal blooms or eutrophication, combined with a strong and stable pycnocline limiting mixing of oxygen to the bottom mixed layer (BML). When the oxygen demand of habitual respiration levels combined with the additional oxygen required for remineralisation of new organic matter exceed the renewal of dissolved oxygen, hypoxia may occur. Some hydrographic factors have the potential of further enhancing this phenomenon: higher upper ocean temperatures lead to increased organism respiratory demand, increased stratification and reduced oxygen solubility. Other hydrographic factors may lead to the resupply of oxygen to the BML. Disruption of the stratification by storms leads to the injection of oxygen into the BML (Rabalais et al. 2009b), although this can also resuspend organic matter leading to post-event enhanced oxygen demand (Van Raaphorst et al. 1998; Weston et al. 2008; Rabalais et al. 2009a, b; Greenwood et al. 2010). Recently, the possibility of increasing hypoxia in coastal zones across the globe has been highlighted by several authors (Diaz and Rosenberg 2008; Middelburg and Levin 2009; Conley et al. 2009a, b). The review by Colijn et al. (2002) highlighted a paucity of studies assessing the impacts of low oxygen regions on organisms and ecosystems in the North Sea. Sedentary benthic and demersal organisms suffer the greatest impacts due to their inability to avoid hypoxic regions. For example, the commercially important species Nephrops norvegicus shows negative sub-lethal impacts in juveniles at oxygen concentrations below 5 mg dm−3 (156 μmol dm−3). Although adults may withstand very low concentrations of dissolved oxygen, their habitual tolerance to other environmental variations (e.g. temperature) is severely decreased (Baden et al. 1990; Eriksson and Baden 1997). Oxygen saturation also plays an important part in sediment biogeochemistry; Middelburg and Levin (2009) review the sedimentary processes which occur under hypoxic conditions. It was previously estimated that the threshold for negative impacts of hypoxia was near the 2 mg dm−3 mark (62.5 μmol dm−3), however the OSPAR Commission has elevated that level to 4 mg dm−3 (125.0 μmol dm−3) in the light of studies assessing sub-lethal impacts and modelling fisheries productivity (Painting et al. 2005). The European Union Water Framework Directive for oxygen defines high water quality as greater than 7 mg dm−3 (218.6 μmol dm−3), good as greater than 4.7 mg dm−3 (146.8 μmol dm−3), moderate as greater than 2 mg dm−3 (62.5 μmol dm−3) and poor below that value. The Shellfish Waters Directive sets standards using oxygen saturation. The minimum imperative standard is set at 60 % saturation and the guide value at 80 % saturation (Best et al. 2007). Both the Water Framework Directive and the Shellfish Waters Directive apply only to coastal waters; offshore waters of the North Sea are covered by the OSPAR Commission. However, the potential influence of climate change trends on oxygen levels in shelf seas in the future is of concern. Weston et al. 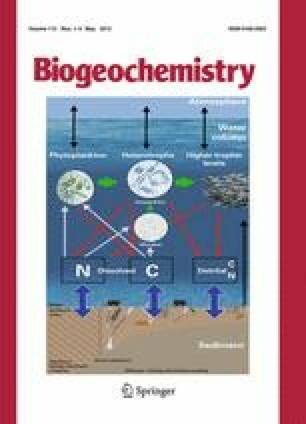 (2008) conjecture that climate change scenarios in the North Sea could see a decrease in BML dissolved oxygen due to increasing temperatures: a temperature increase of 2–3 °C will decrease oxygen solubility by 0.4 mg dm−3 (13 μmol dm−3) at atmospheric pressure. Climate change may also lead to earlier stratification each year and possibly an increase of surface layer productivity; it could also cause a decrease in summer storms disrupting the stratification. All these changes could increase the spatial and temporal extent of deep water low oxygen. For bottom waters to have reduced oxygen content they must be isolated from sources of oxygen saturated water by a strong pycnocline and have weak advection; thus the residual circulation of the North Sea affects the supply of dissolved oxygen. The circulation in the North Sea results from a combination of wind-induced flow, topographically-steered currents and density-driven flow resulting in relatively narrow jets (Brown et al. 1999; Hill et al. 2008). The semi-enclosed situation of the North Sea, coupled with the various inflows lead to an anticlockwise circulation. Water enters from the Fair Isle Current, the Channel and the Skagerrak, and exits along the Norwegian Trench (Ducrotoy et al. 2000; Brown et al. 1999; Thomas et al. 2005; Figs. 1, 2). Very little inflow from the northern boundary reaches south of the Dogger Bank; instead this water circulates north of the Dogger Bank to rejoin southern waters before exiting the North Sea through the Norwegian Trench (Thomas et al. 2005). In the Southern Bight, high salinity water entering the system through the Straits of Dover is gradually mixed with riverine discharge and eventually leaves the system via the Norwegian Trench. It is generally agreed that water in the North Sea has a residence time in the order of 0.6–1 year (Jickells 1998; Otto et al. 1990; Thomas et al. 2005; Van Raaphorst et al. 1998; Vermaat et al. 2008). The North Sea exhibits a generally vertically well mixed pattern in winter with occasional stratification in the deepest regions (Ducrotoy et al. 2000; Sharples et al. 2006). In the stratified North Sea, stratification becomes apparent from mid-April, with a thermocline at a typical depth of 30 m in the north (Ducrotoy et al. 2000; Sharples et al. 2006; Greenwood et al. 2010). South of the Flamborough-Helgoland front (see hatched area, Fig. 2), the shallower waters tend to remain well mixed and warmer throughout the year apart from occasional and temporary salinity stratification (Simpson et al. 1977; Vested et al. 1996; Ducrotoy et al. 2000). The region of the Oyster Grounds (Fig. 1) exhibits thermal stratification, albeit for a shorter period than the north (Greenwood et al. 2010), while the shallow region of the Dogger Bank shows greatly reduced stratification compared to the north (Vested et al. 1996; Ducrotoy et al. 2000). Sharples et al. (2006) showed that the main factor regulating the onset and strength of the stratification was local meteorology, particularly spring air temperatures, and that input of north-east Atlantic water played a reduced role. A correlation was also found between the North Atlantic Oscillation (NAO) and wind speeds; increased wind speeds could lead to later stratification in shallower regions or a more gradual pycnocline development (Sharples et al. 2006). There have been recent reports of low dissolved oxygen in the North Sea. Moorings deployed at the Oyster Grounds (OG) and North Dogger (ND) sites (Fig. 1) during 2007 and 2008 observed summer oxygen depletion in the BML associated with strong stratification (Greenwood et al. 2010). Greenwood et al. measured gradually decreasing dissolved oxygen concentrations reaching 203 μmol dm−3 (71 % saturation) and 162 μmol dm−3 (60 % saturation) at ND and the OG at the end of the summer season prior to breakdown of the stratification in autumn. They examined the evolution of this oxygen depletion throughout the stratified season (April to October) and showed the influence of different physical and biological parameters. The importance of BML warming, accounting for 55 % of the oxygen drawdown at the OG site compared with 10 % at the ND site, was also demonstrated (Greenwood et al. 2010). Following Van Raaphorst et al. (1998), Greenwood et al. (2010) demonstrated that short-term storm events promoted sediment resuspension and subsequent oxygen consumption at the shallow (50 m) OG site. They concluded that decreasing oxygen concentrations were driven both by increasing BML temperatures and the consumption of organic matter. This organic matter originates from the spring bloom and from continuous production in the deep chlorophyll maximum (DCM) (Weston et al. 2005; Greenwood et al. 2010), with the spring bloom showing greater productivity at the ND site than the OG site. The mooring data used by Greenwood et al. (2010) document the temporal evolution of the relatively low oxygen conditions but not their spatial extent. Hence, the aims of this study are firstly to place the recent evidence of seasonally low oxygen at two sites in the North Sea in a spatial context based on a major survey of oxygen concentrations in the summer of 2010; secondly to assess the evolution of summer oxygen depletion in the North Sea over the past century using historical data obtained from the International Council for the Exploration of the Sea’s (ICES) database. RV CEFAS Endeavour cruise CEnd13/10 (Lowestoft, UK, 7th of August to 8th of September 2010) took place approximately 2 months before the end of the stratification period north of Dogger Bank and near the end of the stratified period in the OG (Greenwood et al. 2010). A total of 88 CTD casts were performed during the first 25 days. Water was collected at every CTD station from the surface, the bottom and at the mid-depth chlorophyll maximum (when present) for sensor calibration (Fig. 1). Sample collection was performed with 10 dm3 Niskin bottles mounted on a FSI Integrated CTD rosette (Falmouth Scientific Inc., USA) with an additional Seapoint MOB optical sensor for determination of suspended load, a Seapoint fluorometer and a LICOR photosynthetically active radiation (PAR) sensor. An ESM2 minilogger with an Aanderaa oxygen optode was also attached. Weather was consistent with low wind speeds and an absence of storms during this period. Six hourly 10 m windspeeds and 2 m temperatures were obtained from the European Centre for Medium-Range Weather Forecasts (ECMWF) ERA-Interim data for the central North Sea in August 2010. Mean 10 m windspeed was 7.4 m s−1 with a standard deviation of 3.0 and reached a maximum of 15.7 m s−1 on the final day of sampling. Mean 2 m temperature was 15.37 °C with a standard deviation of 0.38. These data suggest that the survey may be considered as a synoptic survey of the conditions in late summer. The rate of oxygen change in the water column was too low to allow accurate direct measurements of rates of oxygen consumption in incubated samples, although such rates are available from long term in situ data (e.g. Greenwood et al. 2010). Hence the goal here was to reliably map the distribution of low oxygen regions revealed by the results from the moored sampling. Oxygen sample collection and preservation was performed following the Williams and Jenkinson (1982) method to calibrate the CTD optode. Quintuplicate water samples were collected into 125 ml glass bottles through a silicone hose before any other samples were collected for other analyses. Bottles were slowly filled from the bottom three times to overflowing to ensure the elimination of bubbles. Samples were fixed with 1 ml of manganous sulphate (450 g MnSO4 4H2O dm−3) followed by 1 ml of alkaline iodide solution (320 g NaOH & 600 g NaI dm−3). Titration was performed using a Sensoren Instrumente Systeme dissolved oxygen analyser (SIS, Germany) with a photometric endpoint following Williams and Jenkinson (1982) with the iodine being liberated with 5 mol dm−3 sulphuric acid. A total of 10 calibration standards were made using a 0.1 N potassium iodate solution (3.567 g KIO3 dm−3). KIO3 was oven dried for 2 h at 110 °C before weighing. The North Sea is a particularly well-studied area thanks to its economic and strategic importance to Europe. Historical data in the ICES database date as far back as the early 20th century. We have investigated CTD and bottle data from this database for evidence of temporal changes in deepwater oxygen in the North Sea. Only records containing oxygen concentration, pressure, temperature and salinity measurements were used. Data were sorted to retain only measurements from June to September in the bottom third of the water column and binned into ICES grid squares in accordance with Berx and Hughes (2009), to produce data at a scale appropriate to many of the features of the North Sea system. In total, 332015 oxygen values were obtained for the Greater North Sea dating from 1900 to 2010. Of these, 155340 were from months potentially showing summer oxygen depletion (June to September). The number of data points in bottom waters was further reduced with 75000 measurements below 45 dbar. Although the majority of observations are located in the German Bight, the North-East Atlantic boundary and the Skagerrak outflow regions, sufficient data points remain in the central North Sea. In this paper, we loosely define the central North Sea as the offshore region situated between 56 and 58N. Data obtained during the August 2010 survey were not included in this historical analysis and are thus independent. To identify potential trends or regime changes in the region of interest, data were further filtered to retain only areas deeper than 45 dbar and in grid squares north of 56N. This effectively limits the analysis to the BML of the stratified North Sea, with the exception of the unstratified Pentland Firth. An 11-year running mean of summer temperature, oxygen concentration and oxygen saturation was used to ensure sufficient data points were present in each bin. In order to map spatial change, the original data selection criterion was used; measurements from the bottom third of the water column from the entire North Sea were kept, hence allowing analysis of trends in the generally mixed southern North Sea. Grid squares containing fewer than five data points for each period considered were discarded. Mean fields were calculated for 1900–1990 and 1990–2010 time periods to show changes in oxygen saturation. The year 1990 was selected as the boundary due to the results of the timeseries analysis discussed later. The reliability of oxygen concentration values from the ICES database cannot be determined. Although current methods for the determination of oxygen concentrations in seawater are relatively accurate (0.1 %; Williams and Jenkinson 1982), Carritt and Carpenter (1966) found errors near 22 μmol dm−3 (of the order of 10 %) in historical datasets. For this analysis, the data have been treated as reliable despite our inability to verify this. The mapped CTD results reflected contrasting patterns in surface and bottom temperatures (Fig. 3). Surface temperatures (Fig. 3b) gradually increased from 13 °C in the north-west to 19 °C in the German Bight, with slightly higher temperatures than surrounding areas above the shallower Dogger Bank. Bottom temperatures (Fig. 3a) remained low (circa 8 °C) in the stratified areas (e.g. north of Dogger Bank). In shelf seas, stratification is dependent on vertical temperature and salinity gradients, tidal mixing and depth (Simpson et al. 1977). Away from the influence of fresh water inputs (e.g. in the central North Sea) the difference in temperature between the surface mixed layer (SML) and BML provides a proxy for stratification. We observed a very strong temperature-driven stratification (10 °C difference between the SML and the BML) in the central North Sea (Fig. 3h) with a maximum density difference of 2 kg m−3 between the BML and SML (Fig. 2). South of this stratified region, the water column was well mixed. In the offshore northern North Sea, stratification weakened to a 1.5 kg m−3 difference between both layers (7 °C temperature difference between the BML and SML) as bottom waters warmed (Fig. 2). The most strongly stratified region was the Skagerrak outflow near the southern tip of the Norwegian trench (3 kg m−3 difference between SML and BML waters, Fig. 2) due to the fresher surface water. Both the southern North Sea and the Scottish coast as far south as the Forth estuary were well mixed with stratification reducing gradually to a generally mixed water column as depth decreases (Figs. 2, 3h). A North–South section of water column temperatures (Fig. 4a) shows that a strong thermocline separating uniformly mixed layers was present north of 54N. At 54N, the thermocline was at a depth of approximately 25 m, gradually reducing in sharpness and deepening to 40 m north of 54N (Fig. 4a). Shifts in the depth of the thermocline were observed above rises in bathymetry. In the OG basin, the shallower areas on both sides exhibited a less stratified water column with similar properties to the OG SML. The cold BML of the OG basin remained effectively isolated by the topography and relatively weak tides. One notable feature was that the water in the BML north of the ND site was 1 to 2 °C cooler than BML waters further north (Figs. 3a, 4a). In the north–south section (Fig. 4a), this cooler water mass was located between 56 and 58N. The lowest oxygen concentration was associated with this cooler water around 57N (Fig. 4b) and was bounded to the south and north by a rise of the seafloor. These banks effectively isolated this area from meridional transport. The salinity distribution (Fig. 3c, d) was consistent with previous observations (Bozec et al. 2005) of fresh surface water input from the Skagerrak as well as coastal fluvial outflow from rivers draining through the Netherlands, the German Bight and the UK. A tongue of more saline water was observed coming from the Atlantic, following the central North Sea currents and reaching the Dogger Bank region. Bottom water salinities exhibited a much more uniform pattern with a gradual north to south decrease due to the northern inflow of high salinity Atlantic water and fresher water discharges into the southern region (Fig. 3c) following currents illustrated in Fig. 2. Surface oxygen concentrations were highest off the Humber estuary (Fig. 1) and the Scottish coast, reaching 250 μmol dm−3 (Fig. 3f). Two regions demonstrated subsaturation concentrations of oxygen with 220 μmol dm−3 (85 % saturation) and 205 μmol dm−3 (87 % saturation) for the Fair Isle current between the Orkney and Shetland Isles and the German Bight respectively. The rest of the North Sea surface water was at saturation concentration (circa 230 μmol dm−3 depending on temperature). A very different pattern was observed in bottom waters (Fig. 3e, g). Shallow waters not subject to stratification because of tidal mixing (i.e. the southern North Sea; Simpson et al. 1977) were saturated throughout the entire water column (around 210 μmol dm−3). Similar results were observed on the eastern Dogger Bank (230 μmol dm−3). Due to the absence of stations on the Dogger Bank, the interpolation was not able to accurately depict this area but we may assume that the shallow bank showed the same saturated water column as the eastern tip. Although coastal waters off the north-east tip of Scotland were not stratified, bottom water oxygen saturation remained lower than surface waters at approximately 80 % (approx. 220 μmol dm−3). The region west of the Norwegian Trench showed a similar saturation level, with a slightly greater concentration of 230 μmol dm−3. The region just west of the coast of Denmark, extending to the OG, had the lowest bottom water dissolved oxygen concentrations (as low as 180 μmol dm−3). This equated to about 80 % saturation west of Denmark and 70 % saturation in the OG. The major mass of oxygen depleted water (65 % saturation, Fig. 3g) was located in the central North Sea, spanning from the south-east of Scotland towards the southern tip of Norway but stopping where the stratification increased due to the Skagerrak outflow (located between 56 and 58N). Despite having low oxygen saturation, this region did not exhibit a particularly low oxygen concentration (200 μmol dm−3) due to the lower water temperatures causing increased solubility. The North–South section of oxygen concentrations (Fig. 4b) showed them to be highest at the thermocline. This further suggests that the DCM is a region of enhanced primary productivity (Weston et al. 2005). The two locations showing highest oxygen concentrations (250 and 260 μmol dm−3), and therefore showing greatest evidence of enhanced primary production, were mid-water at the OG and around 57N away from the coasts (Fig. 4b). Figure 4c shows super-saturated (above 100 %) mid-depth layers in both these areas where the SML exhibited uniformly saturated (approx. 100 %) surface waters. The lowest oxygen saturation (65 %) was situated in the area of coldest waters; minimum oxygen saturation was found at the seabed with oxygen saturation increasing vertically. The OG region had 75 % saturation at the bed. The BML (north of the Dogger Bank) can be considered as separated meridionally into three regions defined by the banks at 55.5, 57 and 58.5N (Fig. 4). It is likely that little flow occurs meridionally between these three regions at depth due to the topographic features separating them (Figs. 2, 4c), thus these regions are isolated vertically by stratification and meridonally by the banks. Figure 5 displays a 5-yearly 11-year running mean of summer temperature, oxygen concentration and oxygen saturation of the BML in the stratified North Sea. An 11-year running mean was used to ensure sufficient data points were present in each bin to eliminate sampling biases. Points are shown every 5 years to demonstrate the variability in sample size, standard error and standard deviation. These three time-series show no clear trends in oxygen concentration, oxygen saturation or temperature in bottom waters of the stratified North Sea up to 1990. After 1990 the data indicate increased temperatures and decreased oxygen concentrations and saturations. The change in solubility between 7 and 8.5 °C only accounts for approximately 10 μmol dm−3 of the observed 30 μmol dm−3 decrease in dissolved oxygen concentration. A decrease in oxygen saturation of this magnitude implies that the decrease in dissolved oxygen concentration is not due to a temperature-driven decrease in solubility alone but also to an increase in oxygen utilisation. The year 1990 was selected as the boundary because of the 1.5 °C increase in temperature (Fig. 5a) and the doubling of the variability in oxygen saturations (Fig. 5c). Mean fields were calculated for 1900–1990 and 1990–2010 time periods to show changes in oxygen saturation. ICES data used in this study (Figs. 5, 6) show that prior to 1990, oxygen saturation in bottom waters of the northern North Sea (north of 58N) was typically 85–95 %, with elevated oxygen saturations (100 %) in the coastal regions of the United Kingdom, the Netherlands, Germany and Denmark (Fig. 6a). Lowest values were observed just north of the ND site and at the OG with oxygen saturations of around 80 %. Post-1990, low oxygen saturations of 70 % are clearly visible both at the OG and north of the Dogger Bank (Fig. 6b). A few isolated ICES squares also show low oxygen saturations in the northern North Sea. This suggests a decreased average oxygen concentration post-1990. Figure 6c suggests a decrease in oxygen saturation in the central and eastern North Sea after 1990, and increased oxygen saturation in Channel waters, the German Bight and the United Kingdom coastal waters. The regions showing this increasing oxygen saturation signal were well mixed throughout the summer months. Regions with the greatest temperature difference between the BML and SML in August 2010 are the same as those with the lowest oxygen saturation in the 1990–2010 data (Figs. 3h, 6b). A general increase in bottom water temperatures is visible across the greater North Sea (Fig. 6d). This 2 °C increase is uniform across the majority of the North Sea. The German Bight bottom temperatures increase by only 1 °C. Two regions show a decrease in bottom water temperatures: the Dogger Bank, specifically between the ND and OG sites, and the north-west coast of Denmark. Diaz (2001) summarises key findings from similar studies of low oxygen in other areas. Shelf seas such as the North Sea function differently to upwelling regions and resemble areas such as the Gulf of Mexico and the Baltic Sea more closely. However, Foden et al. (2010) found no evidence of undesirable disturbance in English and Welsh waters due to nutrient enrichment. This sets the central North Sea apart from regions such as the Baltic. In this study, both increases and decreases of oxygen saturation were visible in bottom waters of different regions across the North Sea after 1990. Data from the early 20th century show much less oxygen depletion than data from after 1990, however the geographic pattern of low and high dissolved oxygen remains similar. This indicates that the North Sea summer oxygen depletion around the ND and OG sites is not a recent phenomenon but its intensity has been greatly affected in recent years. The most likely causes of this decreased oxygen saturation are warming, altered nutrient loads (either increased concentrations or shifts in N:P:Si ratios) and changes in wind speeds governed by the NAO (Sharples et al. 2006). Greenwood et al. (2010) suggest that increasing thermal stratification, temperatures and biomass input lead to oxygen depletion at both the ND and OG sites. This is consistent with both the ICES historical data and results from the August 2010 survey. BML temperatures increased over the past century (Berx and Hughes 2009; Ting et al. 2009; Meyer et al. 2011). This would result in an expected reduction in oxygen concentration. However, the observed reduction of oxygen concentration cannot be explained simply by changes in oxygen solubility due to rising temperatures. Regions of oxygen super-saturation pre-1990 exhibited elevated values post-1990, whilst regions showing sub-saturation oxygen concentrations pre-1990 had even lower values after 1990. Increase in bottom water temperatures (Fig. 6d) affects oxygen saturation in two ways. Firstly, bacterial and planktonic activity rates and community structure are increased by small amounts of warming, leading to higher respiration rates (Beaugrand et al. 2008). Secondly, temperature influences oxygen solubility and stratification; cold waters will be less saturated for a given oxygen concentration, whilst warmer waters will show higher saturation values. In the central North Sea, stratification is necessary for the occurrence of oxygen depletion (defined as the decrease of oxygen saturation) at depth, whereas a mixed water column may promote saturation. Also, assuming the same initial oxygen concentration, increased temperatures intensify the change in oxygen saturation. In regions with a mixed water column during the summer months, increased primary production would lead to increased super-saturation during blooms. Summer stratified regions also show increased productivity. This greater load of organic matter, however, is remineralised at a greater rate in the bottom layer, away from primary production, leading to further oxygen depletion. Increased nutrient loading in the North Sea would affect planktonic community structure and primary productivity and may contribute to the observed oxygen distribution (Jickells 1998), although other factors also influence the distribution and long-term changes in phytoplankton community in this region (Eppley 1972; Reid et al. 1990; McQuatters-Gollop et al. 2007). Results from the August 2010 survey show the same oxygen saturation distribution as the ICES data and highlight two areas showing summer oxygen depletion: the OG and the central North Sea. Although absolute concentrations do not reach levels requiring management action under the EU Water Framework Directive at ND (200 μmol dm−3), dissolved oxygen concentrations of 180 μmol dm−3 (5.76 mg dm−3) in the OG are close to the Water Framework Directive threshold between good and moderate ecological status and therefore the OSPAR boundary between problem and non-problem area (4–6 mg dm−3). Both regions are subject to stratification. They were the most strongly stratified regions of the North Sea in 2010 outside the fresh water inflow from the Skagerrak (Fig. 3d), emphasising the importance of the sequestration in the BML. Greenwood et al. (2010) highlighted the importance of warming waters decreasing oxygen solubility and calculated that 10 % of the observed consumption could potentially be attributed to increasing temperatures during the stratified season at the ND site. The difference in oxygen concentration at saturation, assuming constant pressure and salinity, at temperatures at the start and end of the stratified season provides a value for the maximum oxygen consumption attributable to warming (Greenwood et al. 2010). The BML reaches a minimum of approximately 7 °C before the stratification is established (Greenwood et al. 2010). Warming of the BML during summer 2010 to its observed temperature of 8 °C (Fig. 3) and consequent decrease in oxygen solubility would only account for approximately 7 μmol dm−3 of the 90 μmol dm−3 apparent oxygen utilisation (AOU) for the region. The AOU is the difference between oxygen concentration at saturation and the observed concentration. This value is similar to the 10 % attributable to warming found by Greenwood et al. (2010) but was recorded in August when temperatures would still increase before the end of the stratified season. Consequently, we may assume that the remaining decrease in dissolved oxygen occurred as a result of oxygen consumption fuelled by organic matter from the spring bloom and the DCM. This is consistent with observations of a persistent DCM (Weston et al. 2005) in this region and agrees with the evidence (Fig. 4b, c) of higher dissolved oxygen concentration and super-saturation originating from DCM production. As the spring bloom occurs in April (Sharples et al. 2006), it was over by the time of the August survey reported here; nevertheless it remains a large source of organic matter for the BML (Davies and Payne 1984). We suggest that the ND oxygen depletion is regulated by two opposing factors while the water column remains stratified. The continual primary production in the DCM increases dissolved oxygen concentration at the thermocline, however the presence of a strong pycnocline prevents the injection of this oxygen into the BML. Oxygen consumption in the BML could be linked to the remineralisation of surface-derived organic matter produced during the spring bloom and in the DCM (Weston et al. 2005; Greenwood et al. 2010). The bathymetry of the surrounding area, in particular large banks, contributes to isolating this water mass from advective processes; to the south is Dogger Bank and to the north is the Great Fisher Bank located south-west of the Norwegian Trench (Fig. 1). The stratification prevents injection of oxygen from the surface, while these two banks prevent meridional advection of well mixed water from the south or oxygen-rich water from the north. Possible mechanisms of oxygen replenishment in this situation are limited to the disruption of stratification during storms (Greenwood et al. 2010), most commonly at the start of winter, or the advection of more oxygenated water from the east or west (Fig. 2). The characteristics of the circulation in this area may exacerbate oxygen depletion in ND. Both the Dooley Current (DC) and the Scottish Coastal Current (SCC) reach this region (Fig. 2). The SCC mostly continues along the south of Dogger Bank. The DC reduces in intensity as it enters the central North Sea (Dooley 1974). Otto et al. (1990) identified ND as an area with little advection and variable, weak wind-driven currents. This slow circulation isolates the deep water mass, provides more time for the remineralisation of organic matter relative to oxygen resupply and may promote settling of organic matter. Although currents in ND seem insufficient to replenish oxygen to saturated levels, it is likely that they inhibit further oxygen depletion by advecting a small yet continuous supply of water with a higher dissolved oxygen concentration to counter balance the consumption. Relatively low (180 μmol dm−3 or 70 %) dissolved oxygen concentrations are also observed at the OG site (Fig. 3). It is likely that the same mechanisms lead to the depletion of oxygen in the BML of the OG as in ND. The presence of the Dogger Bank limits advection from the north and west to the OG while increasing tides and the topography lead to the formation of thermal fronts to the south and east (Fig. 2). These features prolong residence times of water in the OG (Van Raaphorst et al. 1998; Weston et al. 2008). When combined with the presence of a DCM (Weston et al. 2008), this leads to a downward export of organic matter. Although the stratification period is shorter and the DCM is weaker than at the ND site (Weston et al. 2008; Greenwood et al. 2010), the AOU was similar to that observed at the ND site. AOU at the OG site does, however, represent a greater portion of the dissolved oxygen as ND had 210 μmol dm−3 compared to 180 μmol dm−3. It should be noted that the OG site is shallower than ND by nearly 40 m and therefore has a much smaller BML volume so the oxygen consumption per unit volume of water will be higher for a similar vertical organic carbon flux; the shallow depth also facilitates resuspension of bottom sediment by storms, causing further remineralisation of organic carbon (Van Raaphorst et al. 1998; Greenwood et al. 2010). In contrast to the ND site, Greenwood et al. (2010) found a much greater importance of warming in accounting for the oxygen depletion observed at the OG site. Winter temperatures at the OG site are similar to ND, with a bottom temperature of approximately 7 °C (Greenwood et al. 2010). During the August 2010 cruise, bottom temperatures at the OG site reached 10 °C; the 3 °C difference equates to approximately 20 μmol dm−3 corresponding to approximately 25 % of the 70–90 μmol dm−3 apparent oxygen utilisation. The 25 % attributed to warming in summer 2010 is half of the observed 55 % AOU in 2007 (Greenwood et al. 2010). This discrepancy is due to the difference in bottom water temperatures. During summer 2007, the BML at the OG site was 3 °C warmer than in 2010. This may be due to the storm event reported by Greenwood et al. (2010). A sufficiently strong storm weakens the stratification, facilitating injection of warm surface water into the BML. One of the main difficulties in surveys of regions as large as the North Sea is differentiating between spatial and temporal variations. Variability in the BML can be caused by storms; these may cause a break down of the pycnocline and cause mixing of both surface and bottom layers (Van Raaphorst et al. 1998; Vermaat et al. 2008). Air temperature and wind speeds varied minimally during August 2010 and no storms of a sufficient strength to cause such events were observed during the survey period. Synopticity of the survey could also be compromised by natural gradual changes in temperature and oxygen concentration. Greenwood et al. (2010) observed a daily increase of 6.4 × 10−3 °C at ND and 7.25 × 10−3 °C at the OG sites. Assuming that temperatures increased at the same rate in August 2010, the temperature difference between the beginning and end of the survey would have been 0.16 °C at ND and 1.81 °C at the OG. The consequence of this temperature increase would be a decrease in oxygen solubility of 1 μmol dm−3 at ND and 12 μmol dm−3 at the OG. Similarly, biological oxygen consumption rates in 2007 were 0.38 μmol dm−3 day−1 in ND and 0.34 μmol dm−3 day−1 at the OG (Greenwood et al. 2010). Over the 25 days of the August 2010 observations, biological oxygen consumption would have amounted to 10 μmol dm−3 at both ND and the OG based on these estimates. This represents only about 10 % of the observed change and so we can assume that temporal variations were minimal, and that the observed differences were due primarily to different environmental conditions in the ND region. As the OG site was sampled on day 5 of the survey, the observed temperature and apparent oxygen utilisation would have been higher by 0.3 °C and 3.5 μmol dm−3 when ND was sampled on day 9. To fully assess the extent of oxygen depletion in the North Sea in the summer of 2010, we must estimate depletion until the breakdown of the stratification. Stratification sets in around the 3rd week of April (±1 week; Sharples et al. 2006) with little variability, whereas the end of the stratified period is determined by the occurrence of winds sufficiently strong to break down the stratification. This stratification typically breaks down in September and October for the OG and ND sites respectively. Overall oxygen depletion rates in 2007 were 0.43 μmol dm−3 day−1 at ND and 0.75 μmol dm−3 day−1 at the OG (Greenwood et al. 2010). Based on these rates, oxygen concentrations would be 25.5 μmol dm−3 lower on the 15th of September at the OG and on the 15th of October at ND. With this decrease, oxygen concentration would be 154.5 μmol dm−3 at the OG and 174.5 μmol dm−3 at ND at the end of the stratification period. At these concentrations, both sites would classify as “good” under the Water Framework Directive. A hypothetical decrease of a further 10 μmol dm−3, potentially caused by increased stratification or greater export of organic matter, would lead the OG to being classified as “moderate”. It is particularly difficult to assess the evolution of oxygen saturation at depth due to the sparsity of data available in the North Sea. A few regions have been regularly sampled and provide near continuous data while other regions contain solely opportunistic or point measurements. Nevertheless, the results of the hydrographic survey of the North Sea performed in August 2010 are consistent with the recent and historical observations of dissolved oxygen during the summer stratified period. The August 2010 observations build upon observations from the ICES database and results of Greenwood et al. (2010) to elucidate the mechanisms that constrain the location of this deoxygenation. Greenwood et al. (2010) began quantifying the oxygen depletion in the central North Sea, but more studies are required to clarify the drivers behind this phenomenon. This work was funded through a Natural Environment Research Council CASE Studentship between the University of East Anglia and the Centre for Environment, Fisheries and Aquaculture Science. We thank the crew and officers of the RV CEFAS Endeavour for their assistance in this work during the IBTS survey. We thank Dave Sivyer, Naomi Greenwood and Gareth Lee for training and cruise preparation. Thanks also to Rodney Forster, Veronique Creach, and Katy Owen for help during the survey. ECMWF ERA-Interim data used in this study were obtained from the ECMWF data server (2011). Bathymetric data was obtained from General Bathymetric Chart of the Oceans (2010): The GEBCO_08 Grid, version 20100927 (http://www.gebco.net). Temperature, salinity, pressure and oxygen concentration data for the historical analysis were obtained from the International Council for the Exploration of the Sea Dataset on Ocean Hydrography (2011).